This was solid for the time it got. Colby took a scary-looking bump on his head towards the end, but it's entirely possibly he was completely in control of his body and just sold extremely well. This was the usual spottiness, but went on a little longer than I expected. Everyone looked fine, but no one really stood out, either. I was a little surprised to see The Skulk get the win and be set up for another title shot so quickly, especially with this being one of those "win this match and get a title shot later tonight" deals, meaning that any of the non-EVOLVE regular teams could win and Gabe wouldn't even have to book them for a second show to give them the title shot. It was nice to see them give this a decent amount of time. Everything they did was fine, though Adora's cheating seemed odd to me simply because the announcers kept talking her up as a young upstart and mentioning her military service and how hard she works and stuff that would generally make someone feel like a babyface. Said cheating was limited to her choking Priscilla in the ropes a few times, which arguably makes it even more odd because it was such a small thing in the match rather than something to establish her as a total heel, which I think was necessary here because despite the "humiliation" Austin Theory put her through by firing her and being mean to her a few times before that, I'm having a lot of trouble seeing Priscilla as a babyface because we have gotten nothing even resembling a mea culpa for her well over a year of cheating to help Theory win matches and retain titles. Another great showing for Stallion, and Henry continues to grow into someone capable of filling a top spot on a regular basis. After the match we got one of those "LOOK AT HOW PURO WE ARE!" bits that I completely despise where Stallion got up and slapped Henry in the face so Henry slapped him back and it looked for all the world like they were starting to fight again but then they just hugged. This isn't a retirement ceremony; an unrequested slap in the face is not a sign of respect. This was a really great match with a lot of great emotion. Basically, Aichner was angry about some comments that Darby had previously made calling him "a creation of the machine" or something along those lines. This, combined with anger over losing his EVOLVE Title, led to Aichner being extremely aggressive and doing stuff to Darby on the outside and slamming him hard with Darby, never being one to give up, always continuing to fight on. Eventually Aichner's injured knee (the same one that made him miss the previous show) gave out and Darby started working it over but Aichner managed to hang in there. Aichner eventually pinned Darby after a powerbomb-esque move off the rope and then by putting his feet on the ropes for extra leverage, which outraged the crowd. POST-MATCH SEGMENT - Okay. Darby attacked Aichner but Aichner escaped to the outside. Darby cut a promo which was hard to understand because of crowd noise and either the mic not working or Darby not holding it close enough. You could tell from his body language that he was challenging Aichner to a fight. Aichner did the predictable heel "head towards the ring, then back off" for cheap heat. Darby then challenged Aichner to a match tomorrow night at Evolve 120. If you ever wanted a glimpse into what a heel version of the Street Profits might look like, check this match out. The Skulk had another good showing for themselves, and I really liked the finish here. It managed to be abrupt and occur at a completely unexpected point in the match while still feeling completely natural. Major props are due to whoever thought it up. This was basically the minimum acceptable for its spot on the card. There was A LOT of striking here, but things never felt like they got out of second gear until the moonsault that was the finish. Anthony Henry coming out and getting involved on Drake's side (he didn't do much, but he did attack Kingston once) seems to invalidate my Theory that Henry was the one who brought Kingston in to help deal with the NXT talent. Kingston was rather upset about the "two on one" situation, yelling at the referee after the match. This was your standard tag team formula with Fox as the babyface in peril. They did some good stuff to build up to tomorrow's big Theory vs. Gargano match. Briggs looked just fine in there with the main eventers, but he didn't seem to add much of anything extra to the match, either. POST-MATCH SEGMENT - Good angle. Gargano cuts a promo putting A.R. Fox, Ayla and the crowd over, then does the "I think people want to hear my old music" routine... but before the old music can play, he gets attacked from behind by Austin Theory, who rams his back into the ringpost several times and cuts a promo on him. This was a very good show from EVOLVE... but it definitely had that feeling of only being "just good." The wrestling, the booking, the promos; it's all very solid, but nothing is really standing out, which is not a good thing when there are so many options out there. 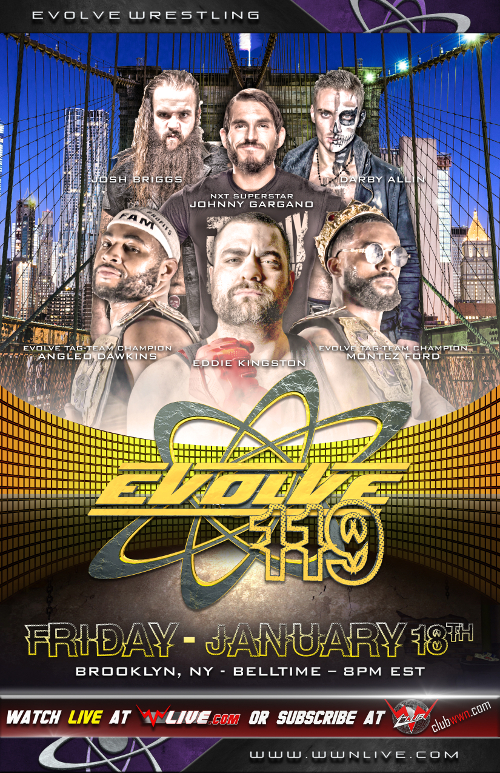 2019 will be an important year in EVOLVE's history as its role in the wrestling ecosystem becomes clarified. This was not a particularly encouraging start, but it wasn't discouraging, either. Hopefully something or someone will step up soon.